Mona Lisa is the most famous face in the world, yet few among the thousands who flock to the Louvre to see her every day know that she was ever stolen. Who pinched Mona Lisa--and why? 1. 98 years ago, Mona Lisa vanished from the wall of the Louvre Museum. 2. No one noticed for more that 24 hours. 3. Pablo Picasso was a prime suspect in the theft. 4. Her mysterious disappearance made Mona Lisa the most famous wanted woman in the world. 4. Mona Lisa remained missing for more than 2 years and was presumed lost forever. 5. A letter signed &ldquo;Leonardo&rdquo; led police to the lost painting. On August 21, 1911, the unfathomable happened&#8211;Leonardo da Vinci&#8217;s Mona Lisa vanished from the Louvre. More than twenty-four hours passed before museum officials realized she was gone. The prime suspects were as shocking as the crime: Pablo Picasso and Guillaume Apollinaire, young provocateurs of a new art. As French detectives using the latest methods of criminology, including fingerprinting, tried to trace the thieves, a burgeoning international media hyped news of the heist. No story captured the imagination of the world quite like this one. Thousands flocked to the Louvre to see the empty space where the painting had hung. They mourned as if Mona Lisa were a lost loved one, left flowers and notes, and set new attendance records. For more than two years, Mona Lisa&#8217;s absence haunted the art world, provoking the question: Was she lost forever? A century later, questions still linger. Part love story, part mystery, Vanished Smile reopens the case of the most audacious and perplexing art theft ever committed. R. A. Scotti&#8217;s riveting, ingeniously realized account is itself a masterly portrait of a world in transition. Combining her skills as a historian and a novelist, Scotti turns the tantalizing clues into a story of the painting&#8217;s transformation into the most familiar and lasting icon of all time. A Very Enjoyable Historical "Whodunit?". Vanished Smile by R.A. Scotti is easy to recommend as it effortlessly entertains while educating the reader about the theft of the world's most recognized painting. While almost every person can conjure the image of The Mona Lisa by Leonardo da Vinci, few realize the fine points of the painting itself and its infamous two year absence. In fact, I find many people in 2009 never knew or have simply forgotten that it was stolen right out of The Louvre where, amazing as it sounds, it was not even immediately missed upon the museums reopening following a particularly sultry French weekend. If this sounds like a "whodunit" crime novel, well, that is exactly how this true tail unfolds in this quick read. The author brings to life a romantic place and time where traditional old world art would soon share wall space with new more avant-garde creations. Intrigue is certainly added as Picasso, an early suspect, lied in order to deflect suspicion (he was actually guilty of stealing from the Louvre...But, what he stole was not the Mona Lisa). The investigation that followed was perhaps the first truly international manhunt; also newly developed scientific methods were implemented providing fertile ground for both fact and fiction! Some may feel the crime story bogs down in the middle as the author devotes ink to explaining the Europe before, during, and after da Vinci's life...But, necessary or not the book is so concise regardless you will simply breeze through it. In my opinion it is appreciated, adding more color. The fact we'll never know for certain exactly all the pertinent details and players behind the greatest art theft in history is at least softened by the fact the genuine "Mona Lisa" still hangs today in the Louvre...Or does it? Pick this book up for an engaging true mystery that, ultimately, has some remaining unanswered intrigue preserved. A very solid three and three-quarter stars...Recommended. The Paris Louvre art gallery is the most visited museum in the world; previously it had been a fortress in the Middle Ages, a palace in the monarchy, the people's museum in the Revolution, a studio for squatters, and Napoleon's showcase. Its broad halls extended more than 1,200 feet, and cover about 15 acres. Upon notification of the missing treasure, police acted swiftly, closing the museum and sealing the borders of France. Security had been lax - there were about 100 passkeys among the building's workers, as many as 800 workers could have been working or wandering in the museum on the day of the theft (even though it was closed), and there was nothing firmly securing the paintings to the walls (fear of fire). (The museum director was quickly fired.) Removal of the painting would have been somewhat hindered, however, by the fact that the painting, with its frame, weighed 87 lbs. Rich American art collectors at the time were massively buying art, and also came under suspicion. Regardless, a record number of visitors returned when it re-opened a week later to view the empty pegs once holding the painting. Two-plus years after the theft, an Italian art dealer received a letter claiming to have the Mona Lisa - signed by Leonardo and postmarked from Paris. The art dealer asked that the painting be brought to him in Florence so he could study it, and after doing so with an expert the dealer agreed to pay $2.4 million (today's equivalent) after further inspection. Instead, police were notified, and the thief was arrested. Turns out the painting had been kept only two miles from the Louvre, the thief had been a glazier there for two years, and had helped seal the Mona Lisa into its new glass case. His declared motive was to avenge art thefts by Napoleon, though evidence in his apartment suggested money was the real motivator. He eventually was sentenced to 7 months and 9 days. Springsteen, in the small classic "Darlington County" quoted above, is willing to give away his mythical piece of the World Trade Center (another landmark piece of art stolen, this one never to be recovered) for a kiss, a smile, and a promise of a little bit more. The Mona Lisa plays her hand from the same deck of cards, with that famously-cool smile promising a little bit more than she could ever deliver, and willing men lining up to take the losing bet anyway. Scotti's slim history recounts the day in 1911 when one man tried to force the girl's hand by boldly lifting her from the wall of the Louvre and taking her for a walk. In today's post-9/11 world, with just haunting holes left to remind us Bruce's piece of the World Trade Center, it is hard to imagine a world where such innocence could be so rudely violated with such simple cynical violence. The outpouring of rage, grief, and scapegoating reflected the emergence of a world-wide media and its celebrity-driven news cycle knitted by telephone and telegraph to an interested and increasingly literate audience. Scotti's tale, really more an extended magazine piece than a stand-alone history, suffers from the paucity of real knowledge about the crime. As the author recounts, the Mona Lisa was eventually recovered two years after the fact when the Italian workingman who had committed the crime offered to sell her to an Italian art collector. Expecting accolades for returning the lady to her national home, he was tried, found guilty, and sentenced--in the shadow of World War I, which exploded across the headlines and pushed him out of them. His sentence reduced (France and Italy were, after all, at war, and his motive may have been national pride rather than personal greed), he served in the war and lived out his life in anonymity. This is what makes history 'fun"! The mysterious theft of Mona Lisa on August 21, 1911. The Mona Lisa vanished from the Louvre. It tool 24 hours before museum officials found the painting had disappered. I really tried to enjoy this book. Yes, this is a true story. And that is the only positive thing I can come up with. Boring, boring, boring. Too many facts, too many details and an author who is truly in love with the written word. But not with the gift of storytelling. Give me a great story and skip the extensive description of a character's moustache. I don't care. I want to be swept away in an exciting, informative and engrossing tale - especially when it is true. But this is not one of them. Perhaps it will turn out better when it is put on film (how ironic), because I have no doubt that someone out there has the rights. Too bad. For once I believe that the movie will be better than the book. R.A. Scotti's "Vanished Smile" is a really intriguing sounding story, and the narrative certainly starts off living up to expectation. About halfway through the narrative, however, he cuts off and starts discussing tangential sub-plots, like how Leonardo DaVinci went about creating and painting this masterpiece. When he finally comes back to the narrative, a few of the important characters seem to disappear entirely, and the book comes to a jumpy, speculative, and somewhat disappointing conclusion. The writing, in the beginning at least, is very well done, if a little wordy and pompous for some readers. The characters and the scenes are gloriously painted and there is a sense of tension and intrigue in every scene. As he transitions to Leonardo's time, we lose track of the characters, the story is left in limbo for a good 40 pages or so, and it turns into a somewhat boring factual account of the artist's life and his aims. When the author again transitions back into the story, much is lost, as the atmosphere and mystery seem to be just sucked right out of the book. I won't reveal the ending for those who are interested in reading this book, but I thought it was kind of a clunker. Speculation more than logical reasoning and evidence seemed to rule the day, and that never really makes me happy. In July of 2007, we were on a local sightseeing bus in Florence, Italy when the recording directed our attention to the Hotel la Giaconda; nothing that it was there that the Mona Lisa was found in a closet. Since I'm a completely inadequate art historian, I didn't have a clue about the 1911 theft of the Mona Lisa or any of the details surrounding it. But I now understand a little more, although we may never truly know the complete story. R.A. Scotti's Vanished Smile brings an excellent combination of insight, research and perspective to this story that should reward at lest the casual art fan (I'll leave it to the serious ones to decide for themselves). From the belated discovery of her disappearance to the recovery of Leonardo's masterpiece two years later, Scotti weaves a fascinating narrative that includes famous names from both the world of criminology and art (did you know that Pablo Picasso was originally one of the suspects?). Perhaps what most enlightened me was a fascinating chapter that gives the reader a better understanding as to the significance of this particular painting, from her original migration from Italy to France, her sentimental appeal to art fans the world over, to the factors that make her such a significant work of art. Yes, la Giaconda was recovered, and the self-confessed thief arrested and convicted, however the case in its entirety has not been fully explained. Scotti attempts to do that with some plausible reconstruction of rumor, fueled by the unsubstantiated claims of a mysterious raconteur and thief. If a century-old true crime tale intrigues you, you should find this particular book fulfilling. Vanished Smile, written about the theft of the Mona Lisa, has all the components of a good novel, but is actually true. The Mona Lisa, a mystery unto itself, given that no one is really sure who the person was or exactly how Da Vinci painted it, is stolen from the Louvre. It is missing and the subject of an intense investigation for over two years, when it is offered for sale to a newspaper. The person arrested for the theft should have been one of the most obvious suspects, but was overlooked when the police formed their theory of the crime. Involved in all of this is constant petty theft from the Louvre, and the possible involvement of a number of well known characters from the Paris scene, including Picasso. When you mix in the theft of one of the best known paintings, the investigation, the implication and arrest of several of the best known artists and impresarios in Paris, you get quite a story, and one that I'm surprised to say is not that well known. The author does a good job weaving in the history of the Mona Lisa, Da Vinci's role and history and painting a picture of Paris at this time, just before World War 1. The ultimate arrest of the thief and his rationale are a bit surprising, but even some of his motives are brought to light. Well worth the read - fascinating look at the history of this work of art that we all know and love - the Mona Lisa. "Mona Lisa, Mona Lisa, Men Have Stolen You..."
Unfortunately, the quality of the writing doesn't do justice to its fascinating topic: The 1911 theft of the Mona Lisa from the Louvre. Too often, the author fails to focus on the topic, and indulges in overwritten sentences that are a disservice to an event--and a history-- that needs no adornment. It's almost as if Scotti just heard a lecture on figures of speech, and wanted to show us what she could do. The metaphors and similes are often forced, the transitions awkward, and she repeatedly (ad nauseum, in fact) personifies the painting of Mona Lisa, while quoting her gushing admirers. That other writers have done this through the centuries is no excuse; it merely highlights how easy and trite this is. The book is padded with overly long digressions on photography's impact on newspaper circulation, the history of France from Mona Lisa's creation to her theft, and speculation into the thieves' identity without suggesting the most likely explanation. This seems almost pre-ordained, we are so inundated with references to the enormous--yet ineffable--appeal of Mona Lisa that this case must remain a mystery. True, it was never solved, but we're left hanging with several alternatives with no editorial stance: It was the work of a lone, uneducated "macaroni" (Scotti recognizes this as a pejorative, but insists on repeating it), or the work of two highly skilled art forgers/distributors, or--as the book's tease would lead you to believe, the result of the young Picasso and friend, Guillame Appolonaire. Scotti writes surprisingly well about Picasso's circle--especially Apollonaire--evoking the latter's character, his betrayal by Picasso, and the tragedy that followed his trial. In addition, her digression on da Vinci's painting technique is relevant and just about the right length. Some of the reseach is impressive, but the citations are limited to the names and authors of his source material, they feel incomplete, and the line between history and historical novel is sometimes blurred. While the writing sometimes has a professional polish, there are sentences and transitions that can only be called amateurish. Napoleon's exploits are described as "Napoleonic!" (Well, of course, he's Napoleon). Similes assult you: "...Mona Lisa's reputation turned as dark as the varnish that clouds her image." 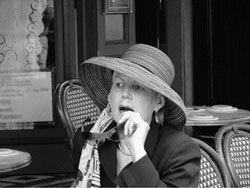 Paris, we're told, spirals out from its center like a snail shell, and Scotti poses the question of which came first, the French love for escargots, or the shape of the city. The city is descrbed as hot in September 1911, but "the arts editor of the Paris JOurnal...remained cool." The next paragraph begins: "The investigation of the Louvre thefts was turning as hot as the weather." You get the picture (and a weather report). HISTORY MADE FUN--reads like a WHO-DUNNIT!!! R. A. Scotti makes history FUN! 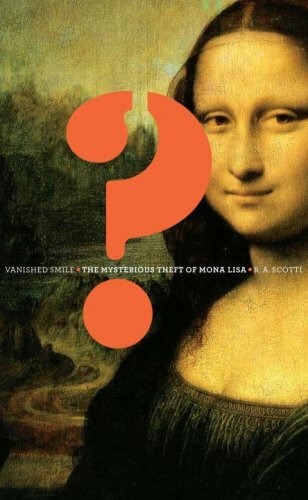 VANISHED SMILE: THE MYSTERIOUS THEFT OF MONA LISA reads like a who-dunnit mystery. She starts with the 1911 theft, then follows along with the investigation as conducted by French officials. Never letting on as to the who as she tells the story of the how. False trails lead to the implication of Pablo Picasso! But, two years later the real thief emerges from the shadows. I won't spoil the ending for you! R.A. Scotti examines contempory as well as later theories as to the WHY of the theft. Included along the way, you'll find lots of information about the history of the Mona Lisa and her creator, Leonardo da Vinci. All of which makes for a fast paced, interesting jaunt through one of history's little "side-shows." Perhaps, like me, you'd never heard about "l'Affaire de la Joconde." It's a story worth learning. One of those strange tales that could happen in ONLY real life! "Vanished Smile" is a history of the theft and recovery of the Mona Lisa from the Louvre, but it reads more like a high-quality detective novel. Before reading this book, I had known the bare bones outline of the story--that the world's most famous painting had been stolen from the wall it had graced for almost a century one day in 1911, and was only recovered after a lengthy absence. Scotti's narrative fills in the details of a canvas every bit as rich as Leonardo's own. The narrative puts us at the scene of the crime, describes the international sensation it caused, sorts through the series of suspects (including the young Pablo Picasso) and theories about how and why the heist was committed, and takes us along as police finally recover the world's most famous painting from a most unlikely thief. Scotti interweaves this gripping story with the back history of the Mona Lisa and covers the post-theft years as well.